Over the last few weeks, I have been photographing a variety of birds at a number of nearby northern Virginia locations, and it is time to devote an article to them, starting with a male Indigo Bunting (above and below). 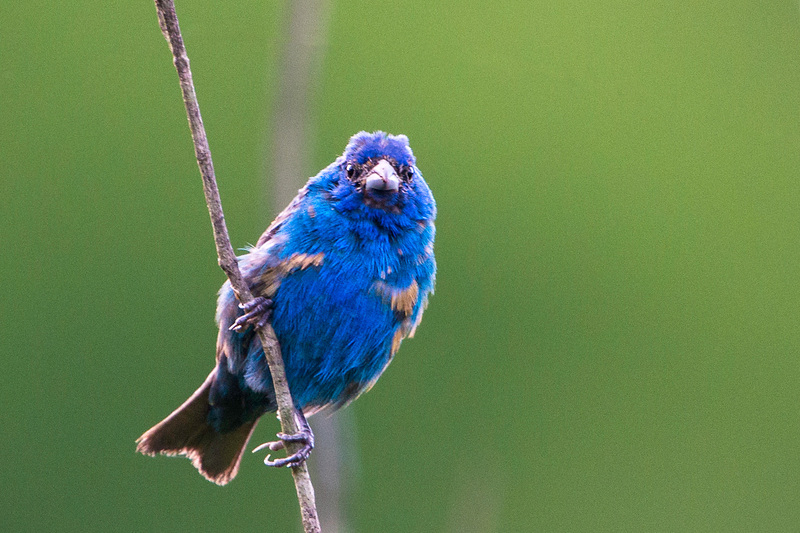 Indigo Buntings are common, brilliantly colored birds found all over the eastern U.S. 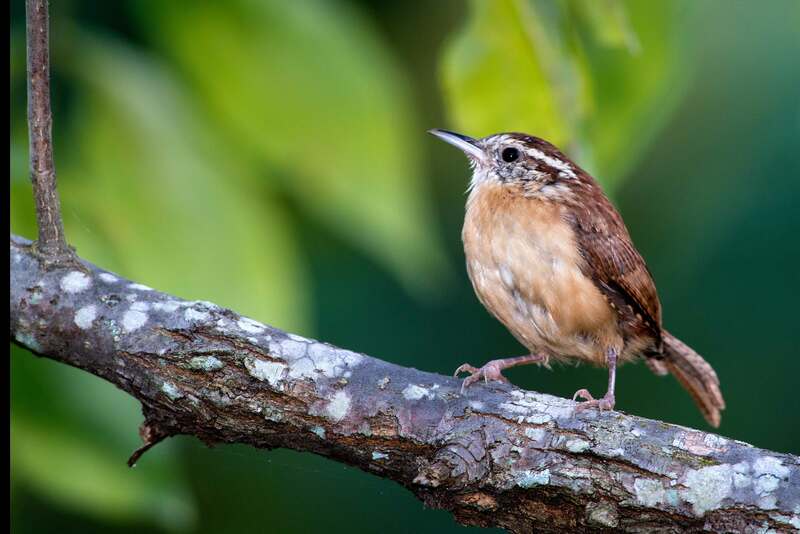 Although males are a bright blue, the females are brown with a faint streaking on their breasts (below image). The male Indigo Bunting in the above images was molting, and therefore, not fully feathered in bright blue feathers. 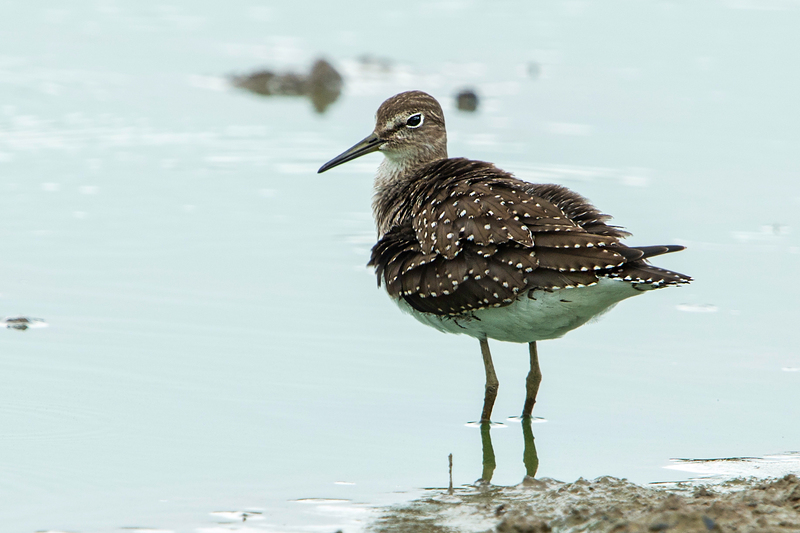 Below is a Sandpiper, which is an active shorebird that is typically seen moving quickly along shorelines in shallow water looking for food. 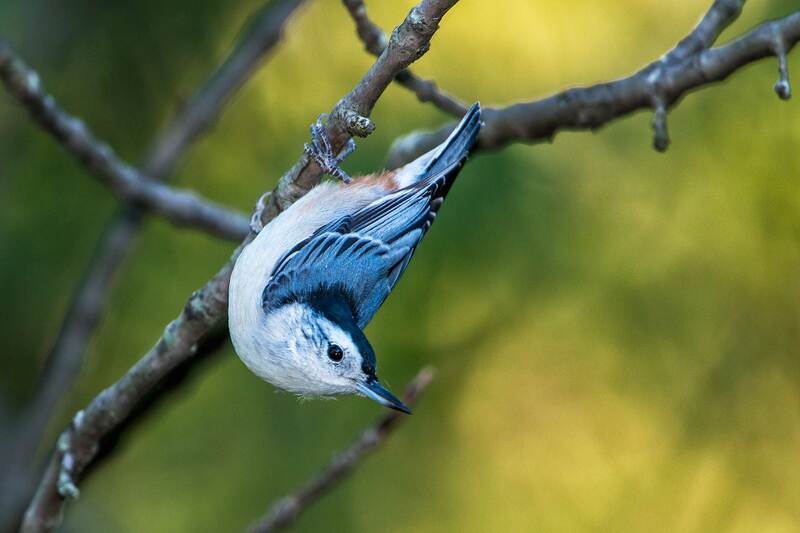 The Indigo Buntings and Lesser Yellowlegs were photographed at Huntley Meadows Park. 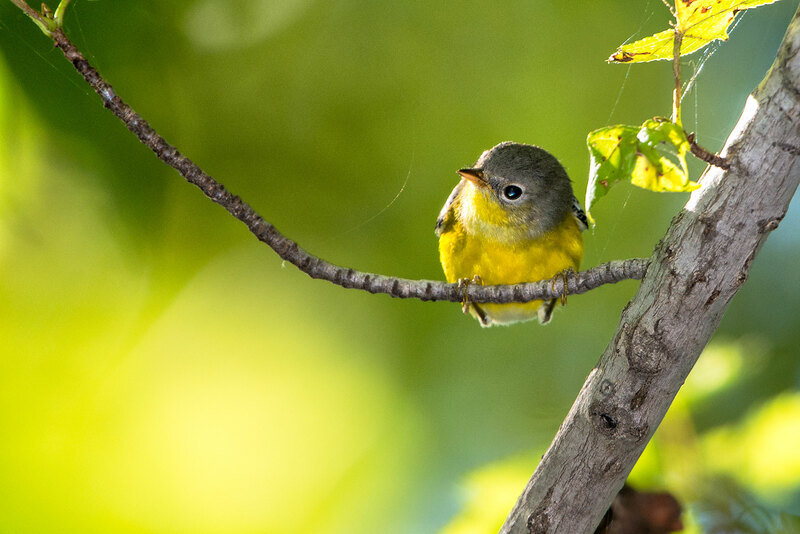 The next image, below, is of an Willow Flycatcher. 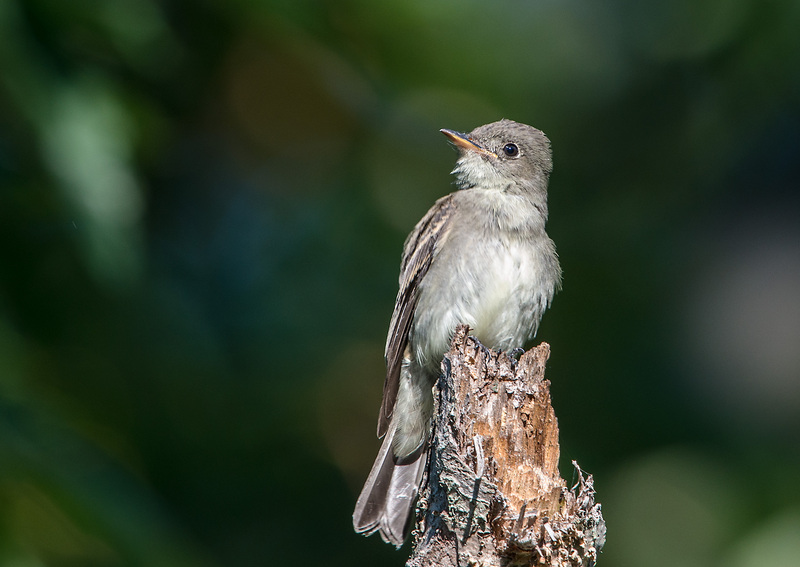 I photographed this Willow Flycatcher at Leesylvania State Park last weekend. 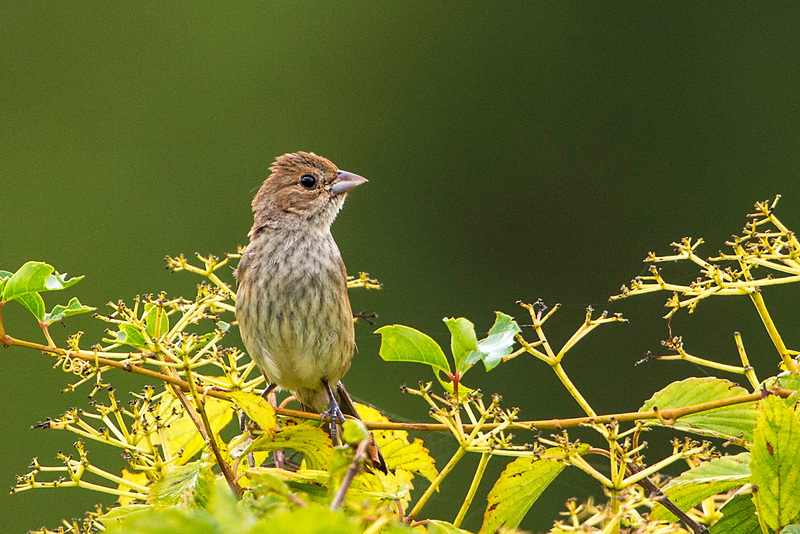 Willow Flycarhers are medium-size flycatchers and forage high in forest trees for flying insects. 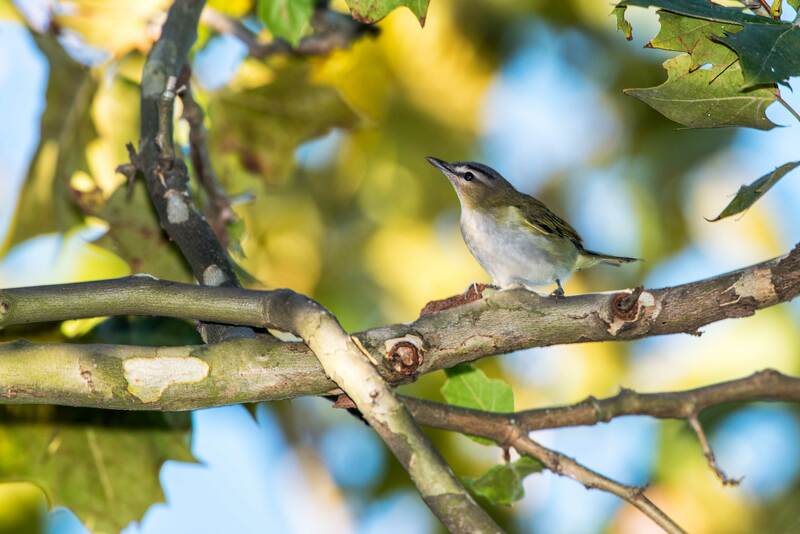 My visit to Leesylvania State Park was very productive, seeing and photographing a variety of birds shown below in the following order: Red-eyed Vireo, White Breasted Nuthatch, Carolina Wren, Black and White Warbler, and Northern Parula. Finally, I was fortunate to be able photograph one more time this season a male and female Ruby-throated Hummingbird. Very soon , they will be migrating south and leaving northern Virginia. 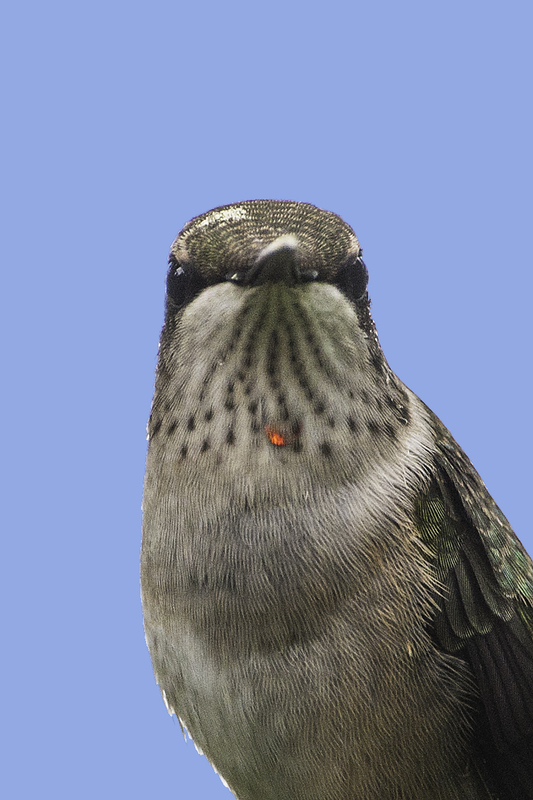 The first two images are of the male hummingbird, who also was molting when this image was shot. That is why he looks a little roughed up. The next images are of the female hummingbird. 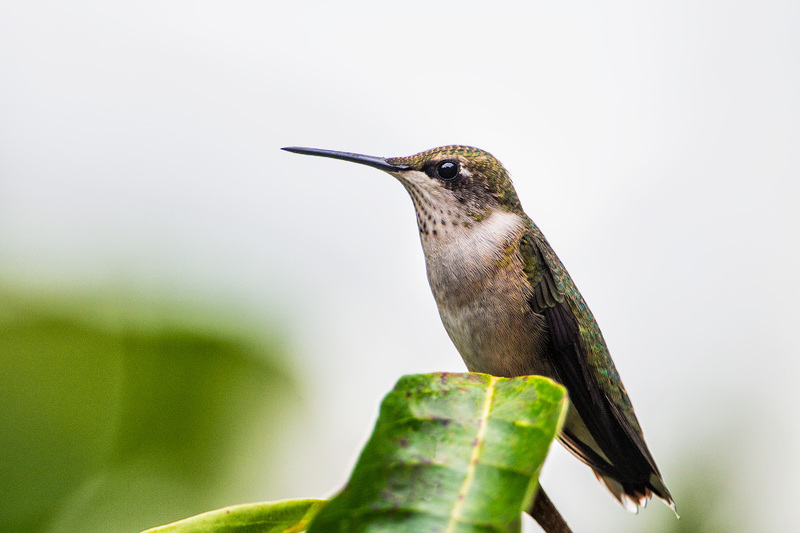 In the first image, she is sitting alert on a branch protecting her territory from other hummingbirds, which I witnessed as she warded off intruding hummingbirds. Her feathers are tight against her body, as she was preparing to soar off. In the next image, she was fluffed up, and more relaxed and preening. 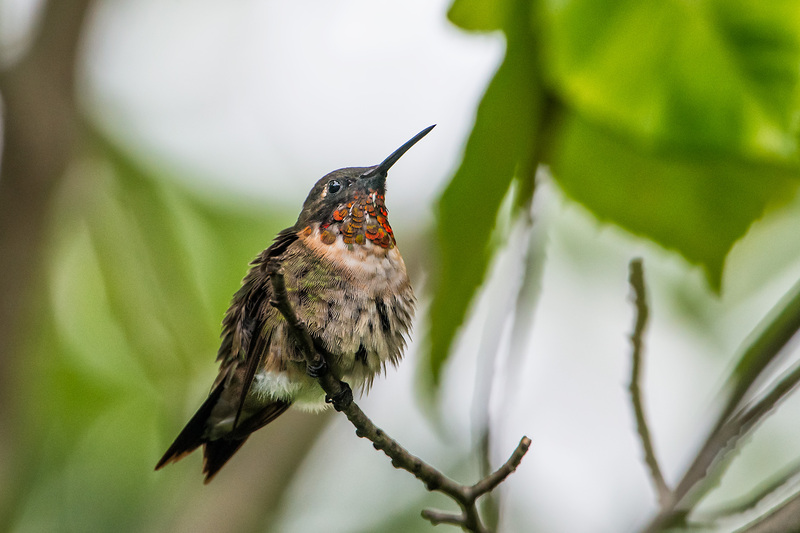 In this last image (below), a closeup of the female Ruby-throated Hummingbird, her one and only bright red feather on her throat can be seen. 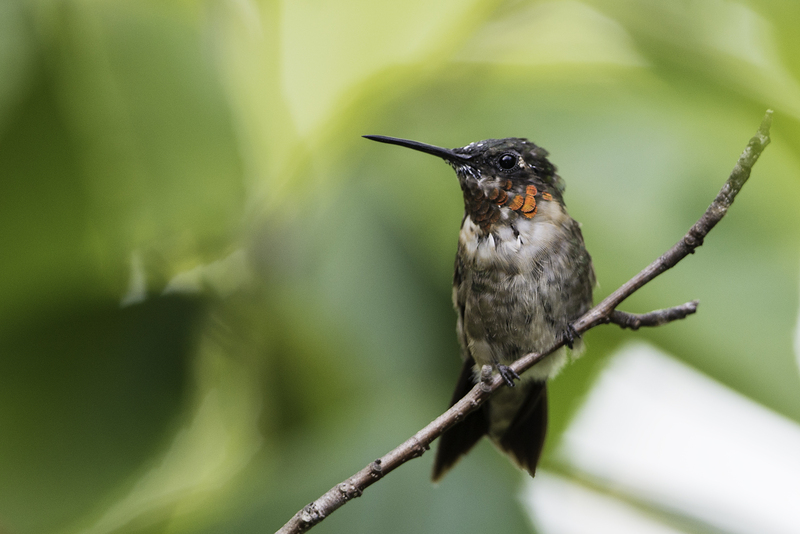 Although the male Ruby-throated Hummingbirds have a large band of bright red feathers on their necks, the females have only one that is rarely seen and only when the light strikes it just right, making it glow brightly. After doing some research this week, I found a location in Maryland where 80 Wood Ducks were spotted last Sunday. I am heading there this weekend and hope to find and photograph at least a few of the eighty. Wood Ducks are very skittish, and every time I have approached them, they quickly flew away. Maybe, this weekend I will get lucky! 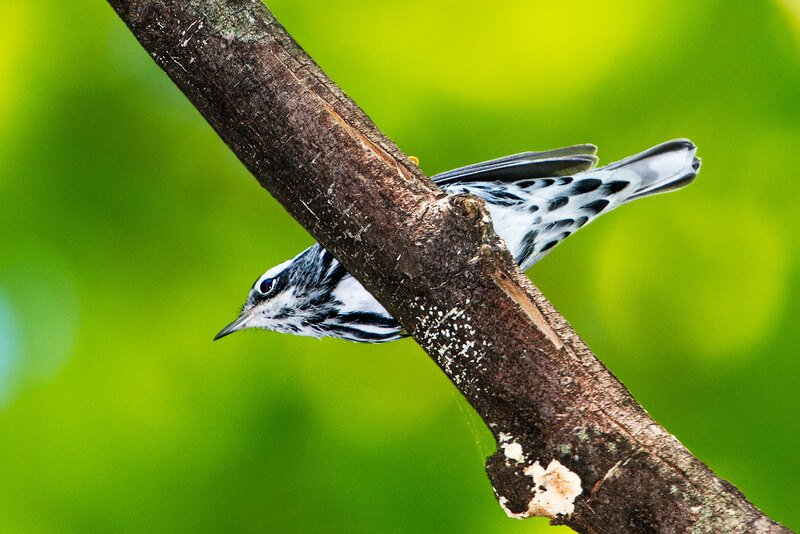 This entry was posted in Bird Photographs, Leesylvania State park, Nature and tagged Black and White Warbler, Carolina Wren, Common Yellow Warbler, Eastern Wood-Pewee, huntley meadows park, Indigo Bunting, Lesser Yellowlegs, nature, Ruby-throated Hummingbird, white breasted nuthatch. Bookmark the permalink. This is for the birds…you guys are remarkable, intriguing, beautiful, and resourceful. And for the photographer…….five stars of patience and efforts to educate us with such beauty. Thank you Anne. 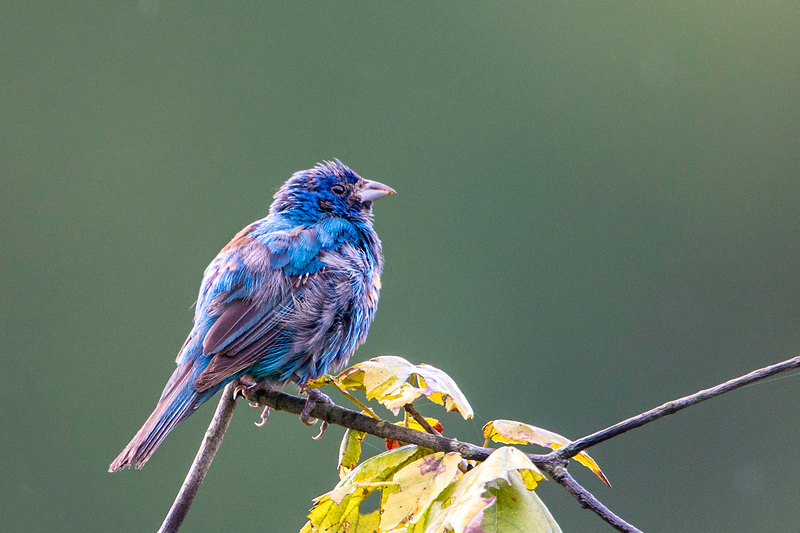 I felt the same way when I saw my first Indigo Bunting, but it was made only more enjoyable watching their antics and listening to their loud calls. I enjoyed these, Stephen! 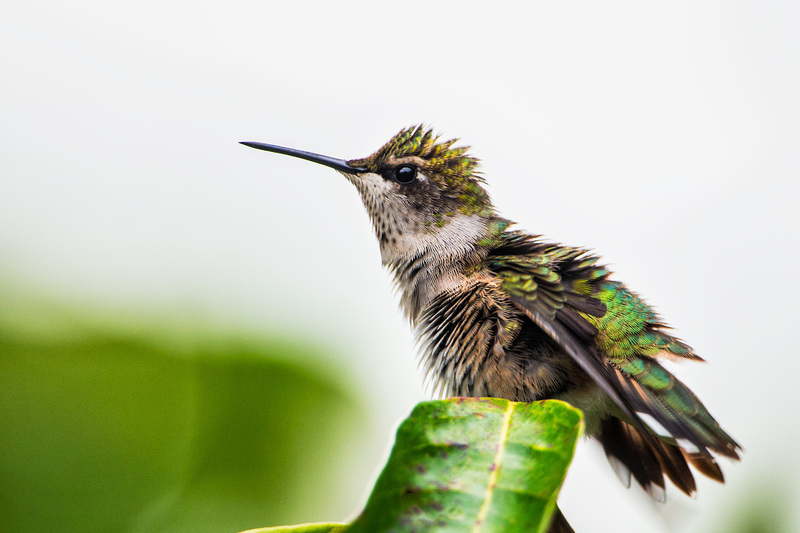 I always love seeing hummingbird photos and other types of birds too. Good luck with the duck photos! I know indigo buntings are supposed to be in my area, but I’ve never seen one, nor many of the other birds here. Lovely work once again Stephen! Brilliant images – what kind of glass are you using? Nice photos! But your last three are of a hatch-year male Ruby-throated Hummingbird. Those dark streaks in the throat area and the one red feather all indicate young male.